Flood alerts remain in force in the UK and the Netherlands, but latest reports suggest fears of storm-driven tidal surges have not materialised. Despite some flooding along Britain's North Sea coast, authorities said the peak of the surge had passed without major incident. A tidal surge in 1953 killed more than 2,000 people in the two countries. Overnight, thousands of people were evacuated in England and surge barriers closed at the Dutch port of Rotterdam. Several oil platforms were closed off the Norwegian coast and gales are forecast in Germany and Denmark. Thousands of people were told to leave their homes along the south-eastern coast of England on Thursday night in preparation for a predicted peak surge of up to 3m (10ft). The UK Environment Agency warned of "extreme danger to life and property" in parts of Norfolk, Suffolk, Kent and Essex and issued eight severe flood alerts. The Met Office meanwhile warned of gusts of up to 145km/h (90mph) for the Orkney and Shetland islands in Scotland. Around 500 people spent the night at refuge centres set up at local schools, local police said. Many others spent the night on the upper floors of their houses. However, when the tides peaked between 0700 GMT and 0800 GMT this morning, officials reported no major breaches of flood defences. 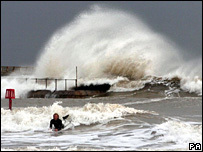 Further surges are expected to hit the English coast around Kent and London, but they will not coincide with high tide. The Thames Barrier is already being raised and the Thames has been declared all clear. The environment agency's chief executive, Baroness Young, said the worst appeared to be over. "It has peaked at about 20cm less than we'd thought, which has just meant that vulnerable towns like Yarmouth have not flooded substantially, though the roads have flooded through seepage," she said at a news conference. "As the storm surge goes down the coast we think it will reduce in size and have less impact." After chairing a meeting of the Cobra emergency committee at 0600 GMT, UK Prime Minister Gordon Brown said his government stood ready to help local communities along the North Sea coast. "We will be able to assess what is happening over the course of the next few hours," he said. In the Netherlands, maritime traffic in Rotterdam was halted as the authorities closed the giant Maeslant surge barrier, which guards the entrance to the largest port in Europe, for the first time since its construction in the 1990s. It took half-an-hour for the two doors of the barrier across the Nieuwe Waterweg to meet, spanning a channel 360m (1181ft) wide. Rotterdam's port will remain closed until 1700GMT on Friday, a spokesman said. Surveillance operations will continue along the northern Dutch coast, although other parts of the country have been told they are no longer at risk. One-third of the land mass of the Netherlands is under sea level. The Dutch transport ministry said this was the first time since 1976 the whole North Sea coast was under alert. 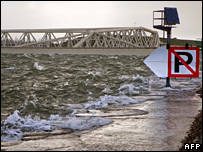 Severe gale warnings were issued in Germany and Denmark, with wind gusts of up to 125km/h (80mph) forecast. In Germany, regions around the Elbe and Elm rivers were under flood warnings. The North Sea storm has also affected oil industry in Norway, the fifth largest exporter of crude in the world, as it was forced to close several oil platforms off its coast. Norway's oil production of 220,000 barrels per day is expected to be slashed by 10% possibly leading to increases in the price of crude, already at record levels, experts say.